Unless otherwise stated, all content on the pages of nwnature.net are the property of Michael R. Clapp/nwnature.net. Unauthorized commerical use and/or duplication of this material without prior written permission is prohibited. I am happy to share my images for non-commercial and/or education uses, provided that it is for limited distribution and represents a limited part of the final product (such as, images used in student projects or classroom presentations). I also ask that credit be given to Michael R. Clapp/nwnature.net as the source of the images. While I hope the information and images on this website are helpful and interesting to the visitors of this website, I also ask that you keep in mind that considerable time and expense has gone into the aquisition of the the contents and development of this website. Whenever possible, contributions to nwnature.net for the support of this website would be greatly appreciated. Welcome to nwnature.net. I hope you enjoy what's here and that you check back regularly to see what's been added. 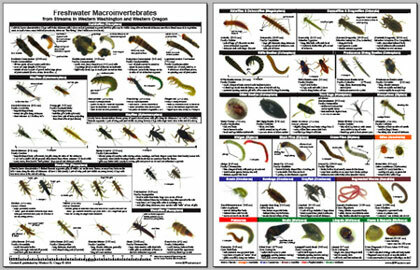 Categorized images of aquatic macroinvertebrates. Most of the specimens were collected from SW Washington (Clark & Cowlitz Counties). The rest of the macros were collected from other locations in Western Oregon and Washington. Expect future updates and additions to this portion of the website as I continue to collect, photograph, and research local macroinvertebrates. Link to an exciting citizen (volunteer) science program in Clark & Cowlitz Counties, WA. The 2013 amphibian egg mass monitoring will be starting soon. A great opportunity for teachers and students to help scientists. Patrick Edwards (Portland State University instructor and Stream Insects of the Pacific Northwest field guide author) is coordinating the Cascades to Coast GK-12 Stonefly Search project. Pictures from hike to Comet Falls in Mount Rainier Nation Park. Includes scenes, plants, and animals found along the trail. Pictures from trips to Saddle Mountain (Oregon) State Natural Area. Includes forest and subalpine plants found along the trail in the park. Pictures from trips to Paradise and Sunrise in Mount Rainier Nation Park. Includes forest and subalpine plants found along the road and trails in the park. Pictures of plants, animals, lichens and fungi taken in a SW Washington lowland/riparian forest. The Wake Robin Learning Center property was donated to the Longview School District for use as an environmental study center. A number of experiments are being conducted by students involving the forest and stream (Coal Creek) running through the property. This part of the website contains images of birds from the Pacific Northwest. Most of the birds were photographed in SW Washington (Clark & Cowlitz Counties). Many of the pictures were taken in my own yard. Expect future updates and additions to this portion of the website. A collection of images from the Point Defiance Zoo & Aquarium in Tacoma, WA. The photos were taken during a "Celebrating Washington's Wildflowers and Wildlife" workshop for teachers, sponsored by the Woodland Park Zoo (Seattle), North Cascades Institute, and U.S. Forest Service, with resources from the Washington Native Plant Society, and hosted by the Point Defiance Zoo. Contains images of Lake Crescent and the lowland forest at Barnes Point. Additional images where taken along the Elwha River, above Lake Mills. The pictures were taken while participating in a teacher's workshop at the Olympic Parks Institute (OPI) in July 2006. 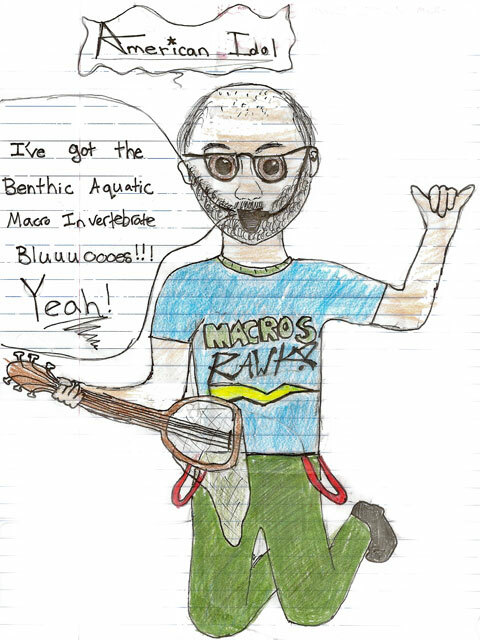 Michael Clapp was recognized with a 2007 Sammy Award (.pdf) for the work he's done in compiling this website, the development of a freshwater macros field guide (shown above), and water quality monitoring of the East Fork of the Lewis River with students at CAM Academy in Battle Ground, WA. The Sammy Award recognizes individuals, groups, or projects for their outstanding contributions to salmon recovery in Clark County.